The Workhorse combines the forged steel strength of Hamilton's HS caster series and the bolt hole pattern of the standard duty 52 series. 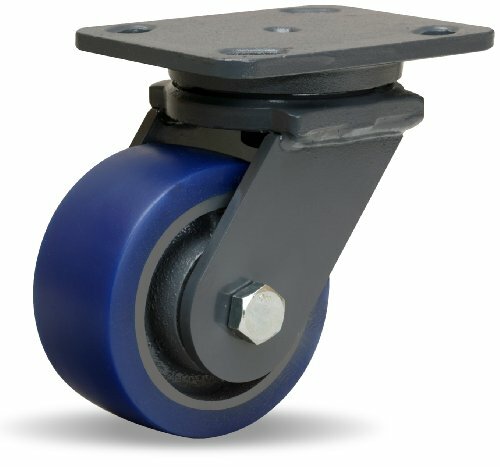 Hamilton workhorse swivel caster with 4" by 2" Poly-Soft polyurethane (85A) on cast iron wheel with 1/2" sealed precision ball bearings. Bolt hole 1: 3" x 3". Bolt hole 2: 2-5/8" x 3-5/8". Bolt size: 0.375". Caster rig type: forged steel. Rigid caster: rigid. Caster color/finish: battleship gray. Wheel color/finish: blue poly on gray center. Wheel diameter: 4". Load capacity: 600lbs. Overall height: 5-5/8". Top plate measures 5" length by 4" width. Wheel face: 2". Wheel type: Poly-Soft. Polyurethane material. High rolling ease, medium relative capacity. Quiet operations, high floor protection. High cushioning (resilience), high impact resistance. Medium moisture resistance, high abrasion resistance. Medium relative cost, -50 degree F low temperature range. 200 Degree F High temperature range, medium chemical resistant.